Keep River National park is a little gem just 3km inside the NT border and is full of rock similar (so they say) to the Bungles. There was a terrific art site and we fluked a corroborree the night we were there. The corroborree was a training one, where the younger men were being coached in what to do, by no means was it a show, but visitors were welcome. 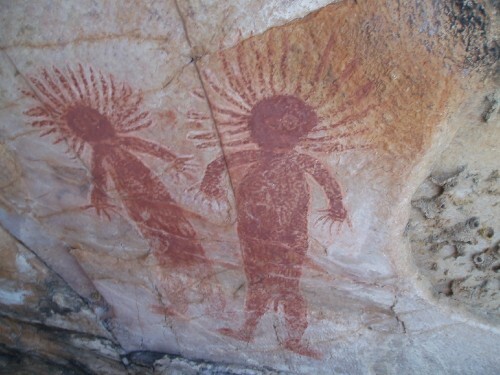 They were painted and one of the men of the tribe explained that the dance was about the time a comet hit the earth (we think he meant meteorite) and he thinks it is the Wolfe Creek Crater. It was certainly very interesting. I took a bit of video as it was at night and performed by the headlights of the rangers car!